Although I have a rudimentary studio set up at Encounter Studio (with a 8×10 Sinar P, a table and window light) most of the still life images that I do of the subject matter around the coastal neighbourhood at Victor Harbor are in open air settings. The method of working is simple. The locations and subject matter are selected whilst I am on the morning or evening poodle walks, I take some scoping photos with the digital camera (an old Sony NEX-7) and, if they work, I come back and reshoot them with a film camera. The bottle had been washed on Dep’s Beach, which is west of Petrel Cove, and I carried it back to Petrel Cove on the return leg of the poodlewalk. 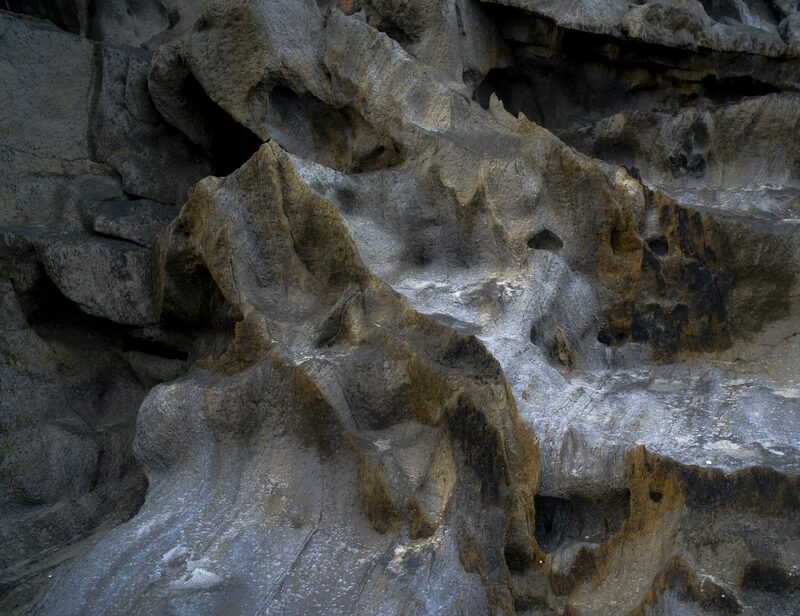 I set it up amongst some rocks, and made some digital pictures. 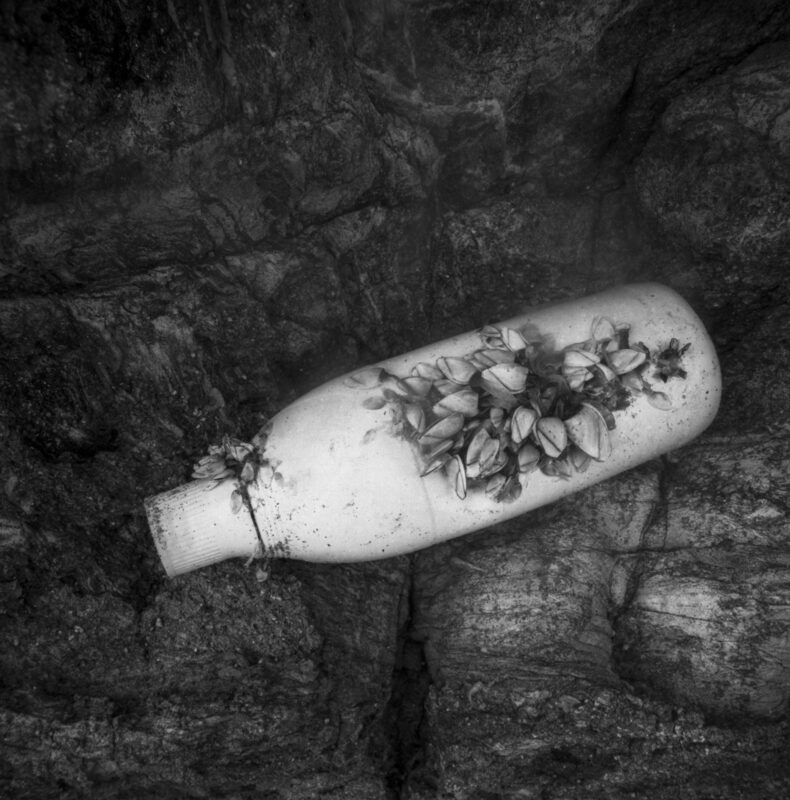 I then hid the bottle amongst some rocks so that people wouldn’t find it and the high tide wouldn’t carry it back to sea. I really do struggle with my landscape photography in and around Encounter Bay on the southern Fleurieu Peninsula of South Australia, even though I do a lot of scoping for it. I struggle in the sense of having both a lots of doubts the value of this working and a lack of confidence in what I am doing —with both the coastal work and the roadside vegetation. So I don’t get very far with working the Fleurieuscapes project as I am not sure what I am doing with it. 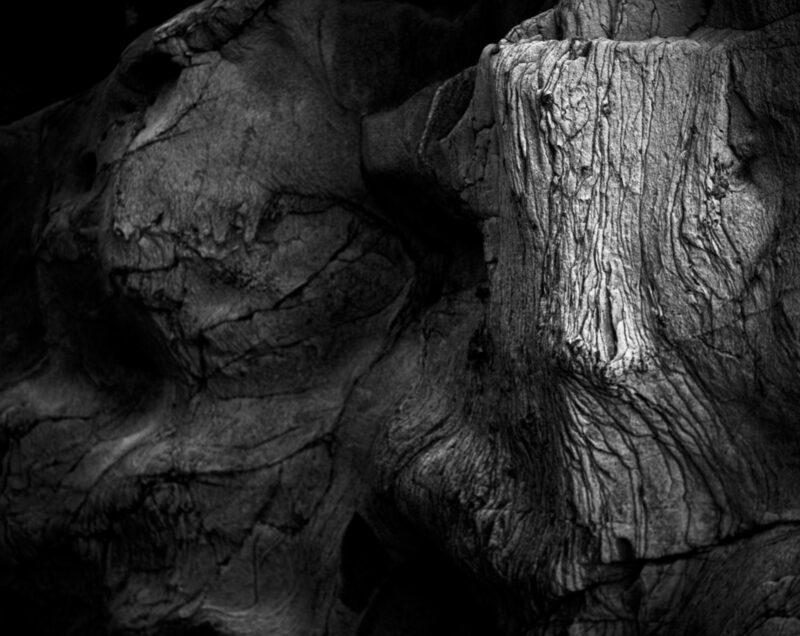 I only have confidence in the abstraction side of this photographic project. The work process is now routine and I am quite comfortable with it. I make a digital study of the object, sometimes convert the colour digital file to a black and white one, and then spend some time assessing the image for possibilities for a 5×4 photo session. Is it worth doing? If so, what is the best way to approach this? 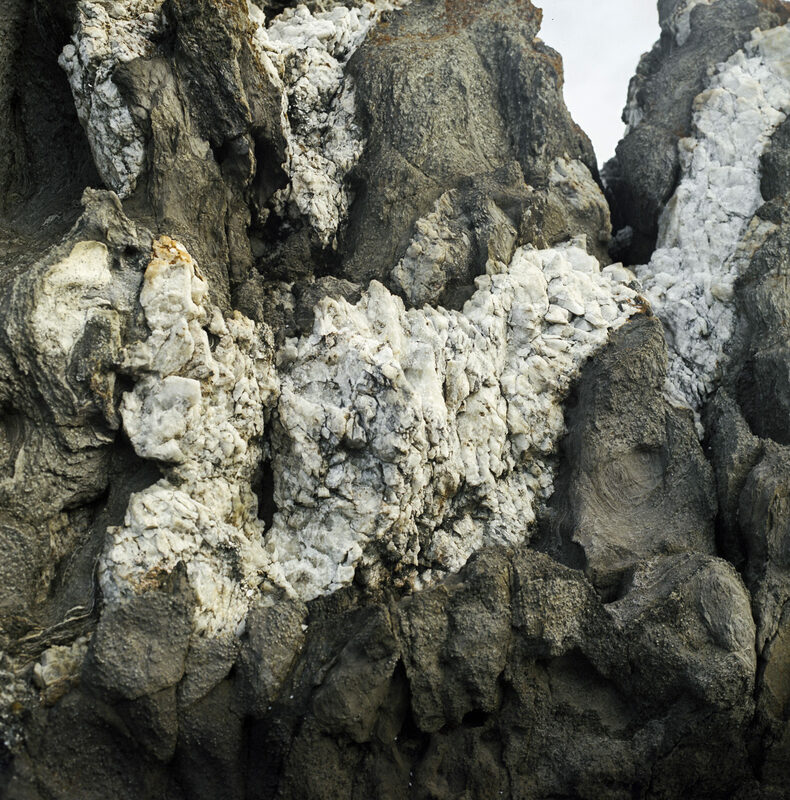 This is an example of the work process –some granite rocks on the beach at Petrel Cove. 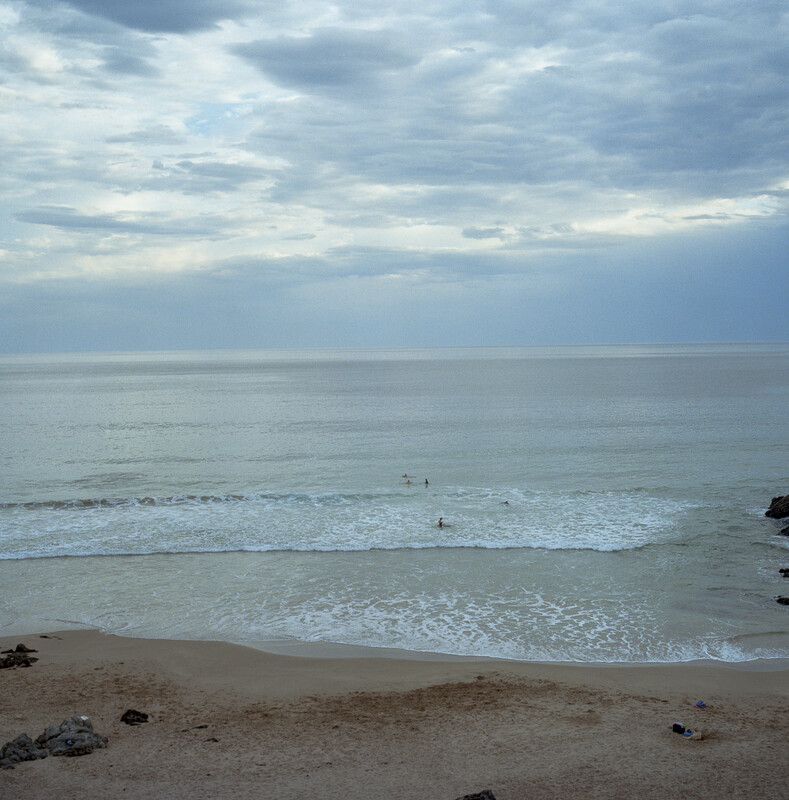 The beach region of the Fleurieuscapes had a minimal presence in the exhibition at Magpie Springs. Images, such as the one of Petrel Cove below, did not make the cut with the curators. Petrel Cove is on the south side of Rosetta Head, and it is a picturesque beach with rocky outcrops, which, despite a dangerous rip, is populated during the summer by surfers, recreational fishers, families and photographers. It represents the pleasurable, freedom and recreation during the summer months without the stench of sewerage, piles of discarded condoms, human faeces, life savers, or racial conflict.